Number of attacks in ATO zone of Donetsk and Lugansk Regions decreased. 77 cease-fire violations in 24 hours. 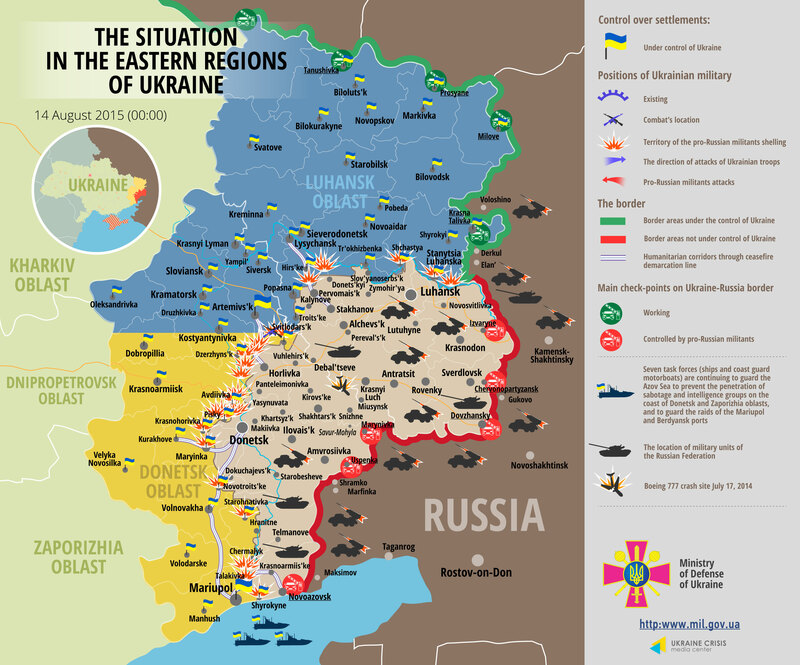 Last night on August 24, 2015, the situation in ATO zone of Donetsk and Lugansk Regions was stable. Illegal armed groups decreased the number of attacks on Ukrainian Army positions. But still they used artillery of a caliber that was more than 100 mm, which is banned by Minsk Agreement. 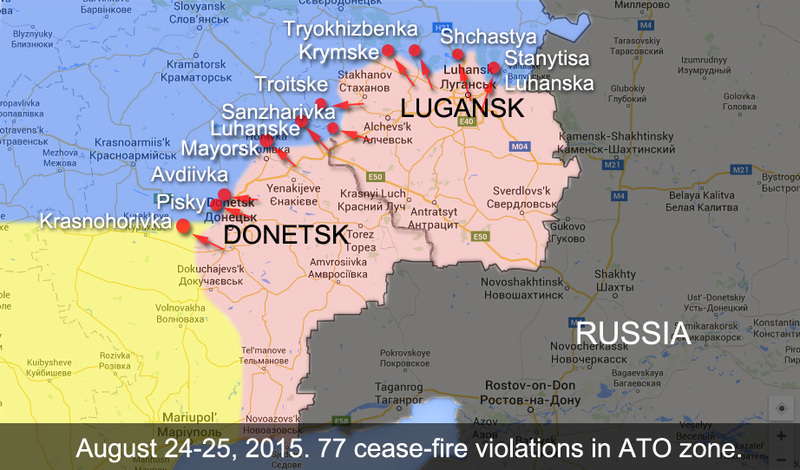 In general pro-Russian terrorists broke cease-fire agreement 77 times. They uses artillery 3 times, mortars – 20 times and grenade launchers – 32 times. Starting from about 6 pm and till midnight occupants shelled ATO forces in Krasnohorivka using 120 mm mortars. And from 9 pm they were attacking Ukrainian Army fortifications in Opytne using a tank, anti-aircraft guns and firearms. Terrorists continue to shell residential areas, from 6:30 pm till 7:06 pm they shelled houses in Krasnohorivka village using 120 mm mortars. And from 10:20 pm residential areas of Avdiivka were shelled by 122 mm artillery. In Lugansk Region at about 9:30 pm Ukrainian fortifications in Shchastya town were shelled by mortars. Terrorists used firearms shelling Luhanske, Troitske, Mayorks, Sanzharivka. At the same time there were no cease-fire violations near Mariupol starting from 6 pm and till midnight. 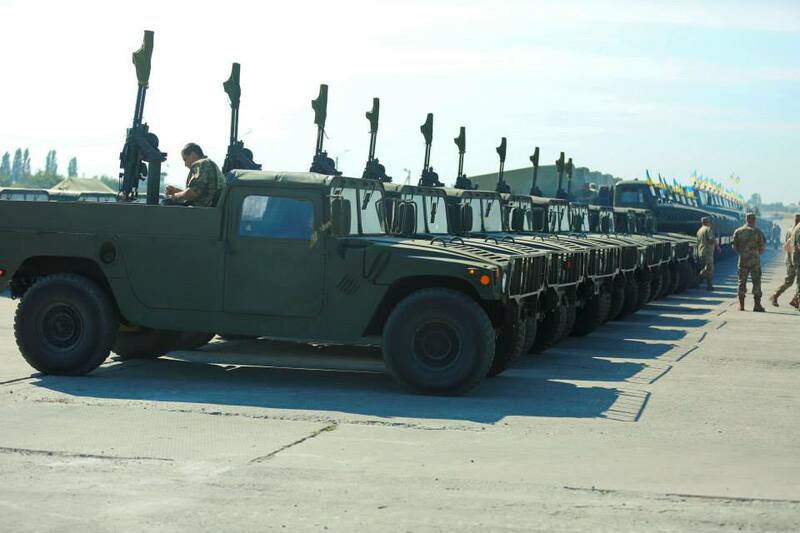 Today Ukrainian Army got 170 military vehicles that were sent to ATO zone. 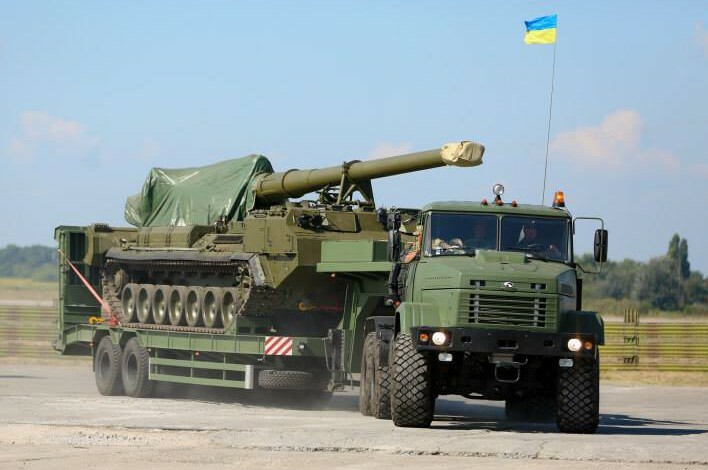 Today on the territory of the military airport in Chuhuiv city (Kharkiv Region) Armed Forces of Ukraine received military equipment and ammunition. In total there were 170 vehicles for Anti-Terrorist Operation in Donetsk and Lugansk Regions. The President of Ukraine Petro Poroshenko also took part in the ceremony. Today we are much better than a year ago ready to defend and protect our Ukraine. Minsk Agreements regardless the criticism gave us time to make Ukrainian defense stronger, it allowed us at least partly compensate our military-technical weakness compared to Russia. For Russians army development was priority since 2000. They were spending crazy amounts of money for 14 years in order to get ready for their aggression against Ukraine. We started to create efficient army only a year ago. Just about a year ago we had less than 10,000 efficient soldiers. 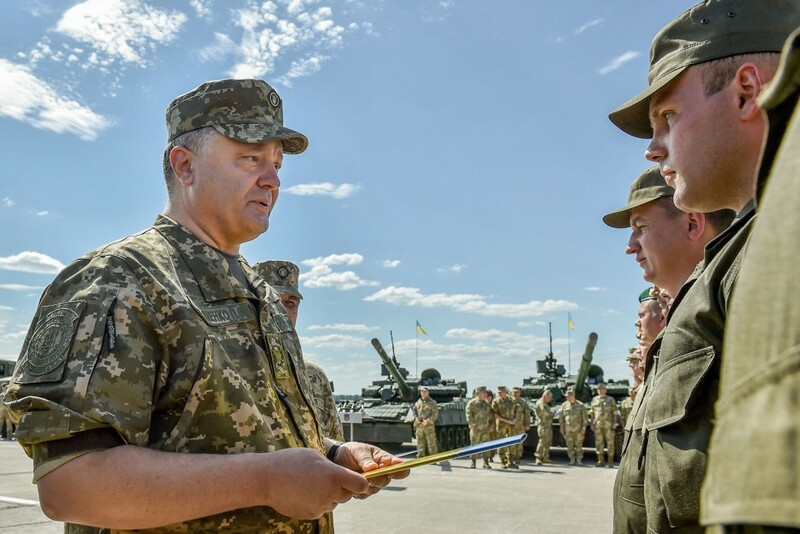 Today you can see that efficiency of Ukrainian Army increased 10 times just in 1 year. The progress is obvious, but it’s still long way to go to get what we want and to achieve my dream. 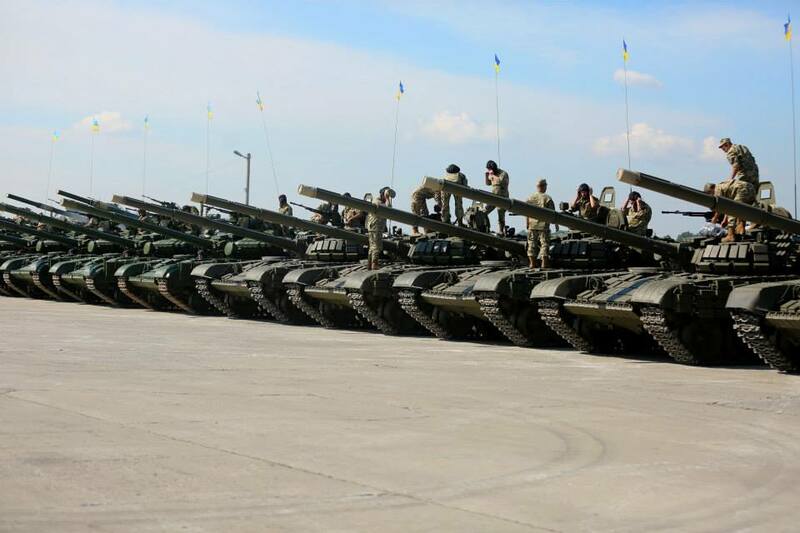 Among military vehicles that were sent to ATO zone on the East of Ukraine there were 25 T-64BM Bulat, T-64, T-72, T-80, 7 MRLS BM-21 “Grad”, 5 SAM “Osa”, 5 self-propelled guns 2S7 Pion, 7 self-propelled howitzers 2S1 Gvozdika, 20 Humvees, 20 APC BMP-2 and BMP-1, 15 canons type MT-12 and MSTA-B, 30 KRAZ trucks, 25 military platform KrAZ trucks, 10 military KrAZ Truck Tractors and other ammo and vehicles. Below is the video posted by the Ministry of Defense of Ukraine of the military vehicles on the territory of Chuhuiv military airport. 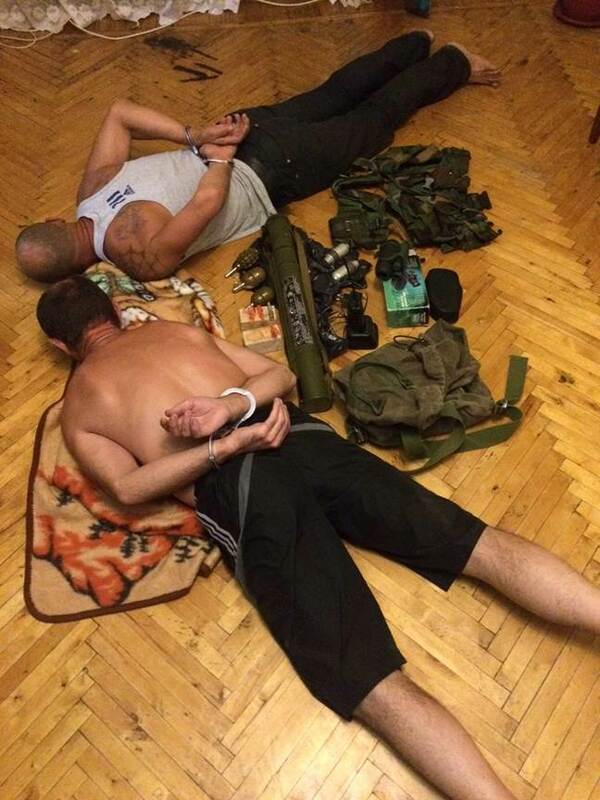 Terrorists group coordinated from Russia was neutralized in Kharkov Region. Security Service of Ukraine neutralized terrorist group in Kharkov Region. That group was coordinated and financed by the leader of terrorist organization “Oplot” Evgeny Zhilin. The group was created in April 2015 by one of the leaders of terrorist organization “Ministry of State Security of Donetsk People’s Republic” who has nickname “Tank”. Later he gave control of the group to Zhilin. The group consisted of 3 people who lived in Kharkov and were in prison before. They were planning terrorist attacks and collected information about ATO units. Members of this saboteur group were travelling to Belgorod (Russian Federation) on a regular basis, they were reporting to Russian secret service there and to Zhilin, who was sending money to their bank accounts. In order to coordinate the group directly, “Tank” sent another female terrorist with nickname “Lisa” (“Fox” in Russian). Starting from the end of last year she took active part in military actions in Donetsk and Lugansk Regions against Armed Forces of Ukraine. All members of the group were detained. 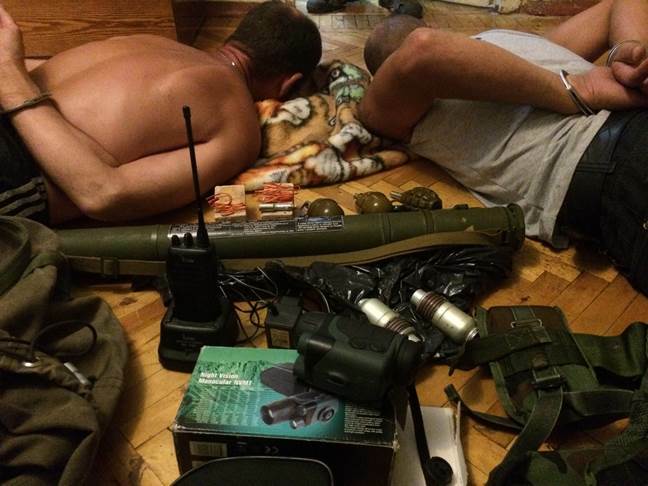 They had RPG-18 grenade launcher, self-made bombs, different kind of grenades and so on. ATO Press Center reports 102 cease-fire violations in Donetsk and Lugansk Regions. During the last 24 hours from August 21 to August 22 illegal armed groups violated cease-fire agreement 102 times. Terrorists uses artillery 14 times, mortars – 28 times, MRLS BM-21 “Grad” – 1 time and firearms and grenade launchers were used 69 times. On August 21 at the end of the day the situation in ATO zone got worse. Illegal armed groups started to shell Ukrainian positions almost all along the contact line. During the day most of attacks were registered near Donetsk and Mariupol. And at the end of the day occupants concentrated their activity in the area of Artyomovsk. From about 7:30 pm till 8:05 pm Ukrainian positions in Zolote were shelled by 82 mm mortars 3 times. 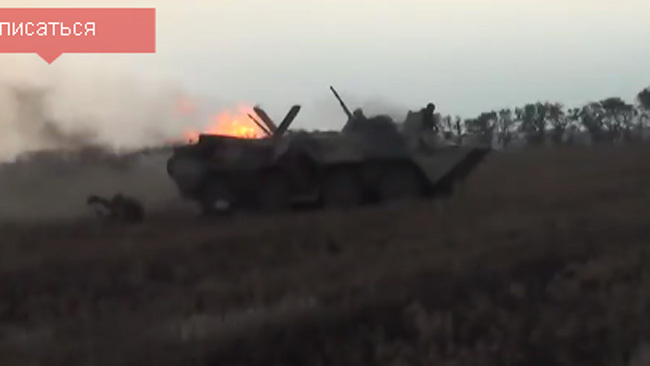 And at about 9 pm occupants attacked near that village using APC and 122 mm artillery. At about 7:33 pm terrorists shelled Ukrainian fortifications using 120 mm mortars and at 8:46 they used 122 mm artillery shelling Ukrainian positions at Popasna village. In Lugansk Region at 8:15 the enemy shelled Ukrainian villages Svitlichne and Novotoshkivske using 120 mm mortars. And at about midnight Ukrainian fortifications at Valuiske village were attacked by 152 mm artillery. In Donetsk Region at night enemy attacked Pisky, Krasnohorivka and Mariinka using 120 mm mortars. Starting from 6 pm till midnight the situation near Mariupol was relatively quiet. Terrorists fired at Ukrainian units in Novoselivka Druga. After midnight and till 6 am terrorists mostly used firearms near Donetsk. 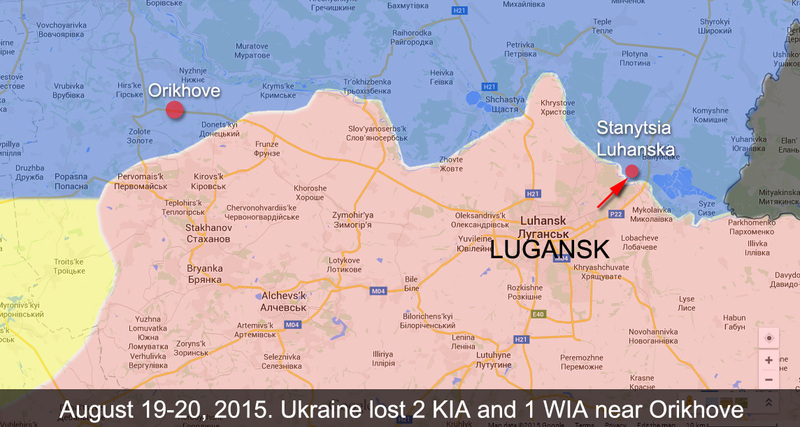 Ukraine lost 2 KIA and 1 WIA in Lugansk Region. Terrorists attacks continue. 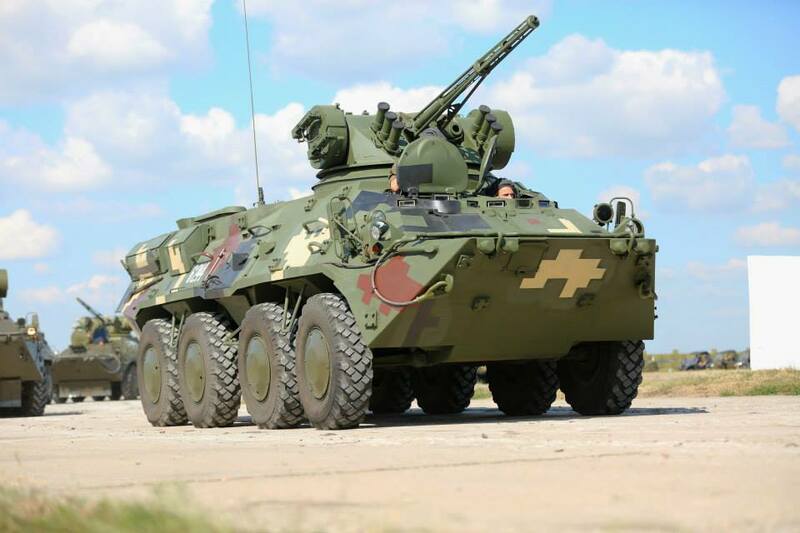 Last evening in the suburbs of Orikhove village located on Ukraine controlled part of Lugansk Region 3 soldiers of 17th Tank Brigade stepped on a landmine. 2 of them got killed and 1 was seriously wounded and taken to the hospital in Severodonetsk. Stanytsia Luhanska was shelled from 21:05 till 22:35 by terrorists of so-called Lugansk People’s Republic who used 82 mm mortars and ATGM. Gas pipeline was damaged and got on fire, repair team managed to fix it before the morning. Also 2 buildings were damaged at Barabashova St. 67 and Lermontova St. 21A. Terrorists continue to shell Stanytsia Luhanska. I think there is no need to search logic in what they do. Attacking villages located on the contact line they just want to fire as much shells as they can, so their masters would send them another humanitarian aid convoy with ammo and they sell it for profit. And so they live waiting for the next convoy every time destroying infrastructure and people in the region. 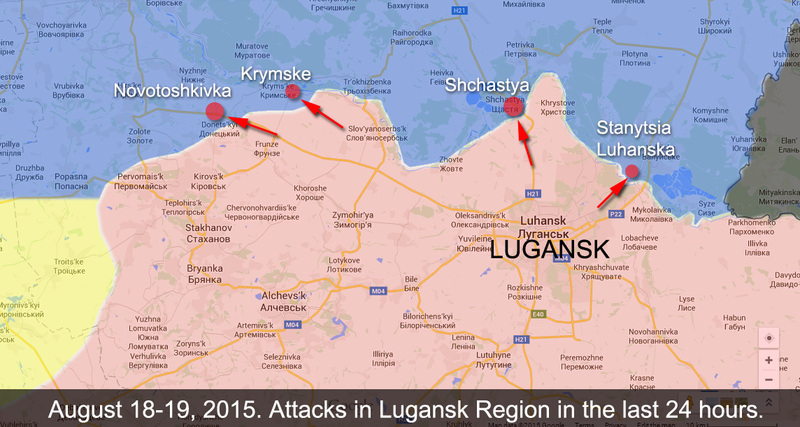 Terrorists continue to attack residential areas on Ukraine controlled part of Lugansk Region. In the last 24 hours illegal armed groups continued their aggression in Lugansk Region. They shelled at Krymske and Stanytsia Luhanska. George Tuka said that terrorists started to shell residential areas on another bank of Siverskiy Donets river to satisfy their sadistic desires. Terrorists of so-called Lugansk People’s Republic shelled at Krymske village using a tank. The shell exploded near Ukrainian checkpoint. At the same time a sapper of 24th Mechanized Brigade was wounded while demining the area near Krymske. He was evacuated to the hospital in Severodonetsk. Stanytsia Luhanska was shelled from 22:00 till 01:00 from “Vasylyok” mortars, ATGM and automatic grenade launchers and with the use of firearms. A house on Lermontova St. got on fire. Gas pipeline was also damaged, but it was fixed before the morning. 50 y.o. civilian from Valuiske village was wounded at 16:00 in the area of control crossing point to Lugansk city which is not working now. Terrorists started to shell civilians in residential areas on the other side of Seiverskiy Donetsk river for their sadistic desires. Lugansk Regional Military-Civil Administration closed that crossing point to occupied territories long time ago as that was dangerous for civilians. – George Tuka, the head of Lugansk Region. ATO Press Center reports 148 attack on Ukrainian position. Several villages near Mariupol shelled by artillery. ATO Press Center reports that in the last 24 hours the situation in Lugansk and Donetsk Regions got worse and the enemy activity dramatically increased. In total from August 16 till morning of August 17 Russian-terrorists troops broke cease-fire agreement 148 times. The enemy used artillery 17 times, mortars – 59 times, MRLS BM-21 “Grad” – 13 times and 70 times they used firearms and grenade launchers. Traditionally, the worst situation was near Donetsk. Starting from 6 pm illegal armed groups shelled Ukrainian positions in Krasnohorivka, Pisky, Mariinka and Pervomaiske using 120 mm mortars. From 19:50 for an hour fortifications of ATO forces in Troitske were attacked by terrorists with the use of MRLS BM-21 “Grad”, mortars, grenade launchers and firearms. 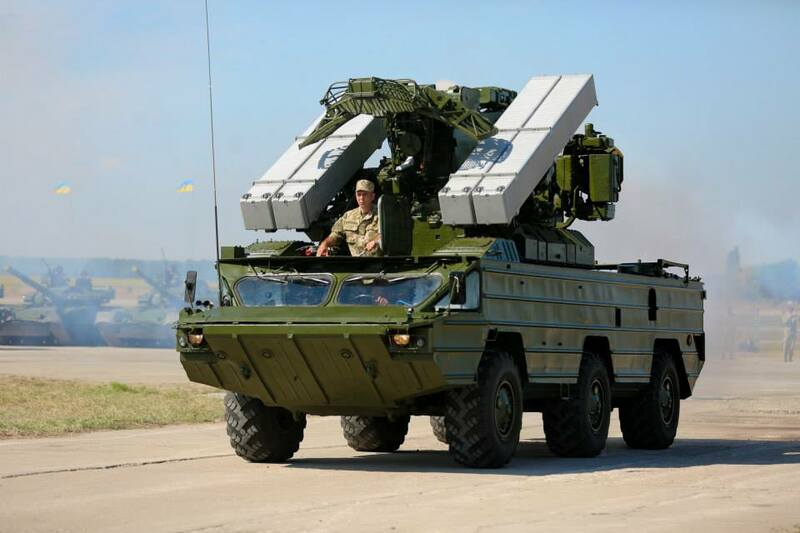 From 21:25 till midnight mercenaries shelled Opytne 5 times using MRLS BM-21 “Grad”. At about 22:00 Ukrainian positions in Avdiivka were shelled by 152 mm artillery and mortars. Also during the night this village was shelled by MRLS BM-21 “Grad” twice. Also from 10 pm and till midnight fortifications of ATO forces in Pisky, Krasnohorivka, Berezove and Verkhnyotoretske were shelled by MRLS BM-21 “Grad”. In the area of Mariupol at 21:40 illegal armed groups shelled Novohryhorivka using 122 mm artillery and mortars. And at about 10 pm terrorists used 152 mm artillery attacking Ukrainian positions in Hranitne and Sartana. On August 17 after midnight and till 6 am enemy activity decreased. In Lugansk Region Ukrainian Army positions were attacked 17 times near Troitske, Shchastya, Popasna, Tryokhizbenka and Stanytsia Luhanska. The highest number of attacks reported by ATO Press Center. 175 times terrorists shelled Ukrainian positions. ATO Press Center reports that in the last 24 hours from August 14 till the morning of August 15 there was the highest number of attacks on Ukrainian Army positions ever registered in the last few months. It total terrorists of so-called Donetsk People’s Republic and Lugansk People’s Republic violated Minsk cease-fire agreements 175 times. They used artillery 25 times, mortars – 64 times, MRLS BM-21 “Grad” – 19 times, 93 times terrorists used firearms and grenade launchers. Attacks on Ukrainian Army positions in the last 24 hours. Starting from 6 pm till midnight Russian-terrorist forces concentrated their activity near Donetsk. Ukrainian Army positions in Krasnohorivka were attacked 5 times by 120 mm mortars. At about 9 pm Avdiivka and at about 10 pm Novoselivka, Novomykhailivka, Novobakhmutovka and Vodyane were attacked by enemy artillery of 152 mm caliber. From 9:50 pm pro-Russian terrorists broke cease-fire agreements and shelled Novoveselske, Pisky and Vodyane using MRLS BM-21 “Grad” from their positions at Abakumova coal mine. From 10 pm till 10:25 pm Ukrainian positions at Pervomaiske village were shelled by enemy artillery of 152 mm caliber and by MRLS BM-21 “Grad”. Talakivka village located near Mariupol was shelled by 120 mm mortars one time and MRLS BM-21 “Grad” twice. In Artyomovsk direction from 6 pm enemy artillery was shelling positions of ATO forces in Dzerzhinsk, Leninske, Sanzharivka. At about 8:30 pm terrorists attacked Zaytseve village using tanks and 120 mm mortars. At 10:25 and at 11:45 terrorist were shelling residential areas of Avdiivka and Pavlopil deliberately destroying cities infrastructure using MRLS BM-21 “Grad”. 1420 terrorist attacks in ATO zone since August 1 2015. 24 Ukrainian soldiers killed and 131 wounded. Pro-Russian terrorists continue attacks on Ukrainian Army positions in ATO zone of Lugansk and Donetsk Regions. Only from the beginning of this month since August 1 2015 illegal armed groups of so-called Donetsk People’s Republic and Lugansk People’s Republic broke Minsk cease-fire agreements 1420 times. Ukrainian Army lost 24 soldiers killed and 131 wounded. Terrorists are using weapon that should be removed from the contact line according to Minsk Agreements, such as 120 mm mortars, 122 mm and 152 mm artillery and MRLS BM-21 “Grad”. Below is ATO zone map as reported for today August 14, 2015. You can full size map here. The video itself is taken by Russian citizen, there is no doubt about that as he has very strong accent typical for people from central Russian cities like Saint Petersburg. At the beginning of the video the operator says that they got lost and were 2 km away from the destination, other guys screaming that some other separatists unit is shooting in their backs. Read our post about Russian special forces veteran who took part in attack on Lugansk Airport and other Ukrainian fortifications here “Royal Flush”. Russian Special Forces soldier fighting in Ukraine showed us all! The group of fighters are walking behind APC that has Lugansk People’s Republic abbreviation (in Cyrillic “ЛНР”). Some other fighters are walking just in the field without keeping any typical military formation. In the video there are least 3 APC. Ukrainian tank shot back at LPR unit after it got hit with ATGM. At 4:55 another ATGM was shot at the tank. 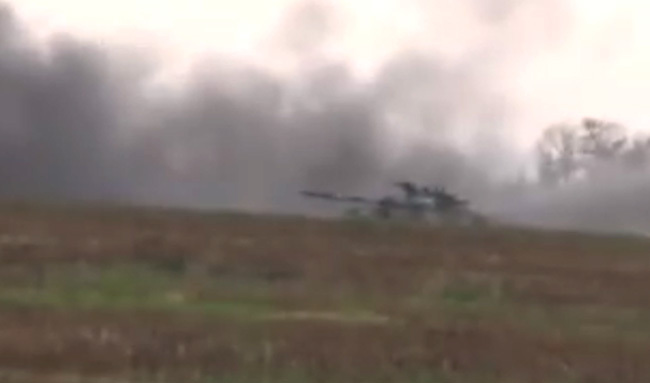 At 5:19 Ukrainian tank shoots back after being already hit at least 3 times. At 5:28 another ATGM is shot at the tank. 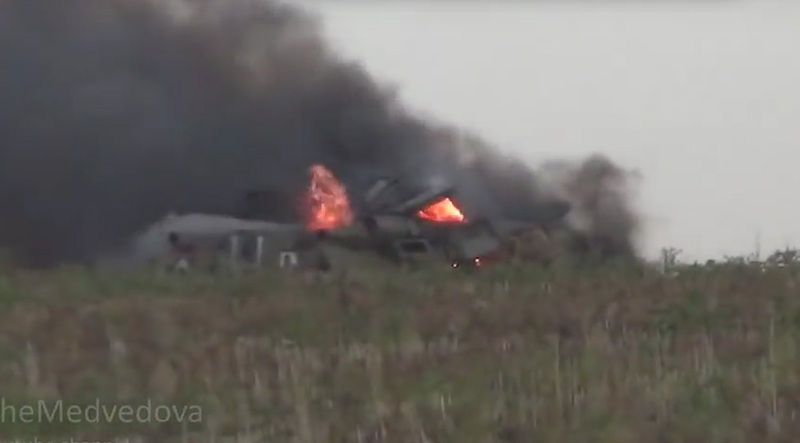 At 5:34 Russian APC is burning, terrorists are jumping out and screaming, so obviously Ukrainian tank hit the target. 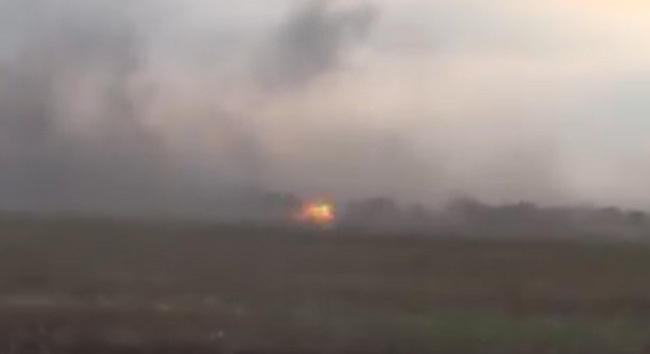 At 5:39 another Russian APC is burning while terrorists keep shooting in the direction of Ukrainian tank. 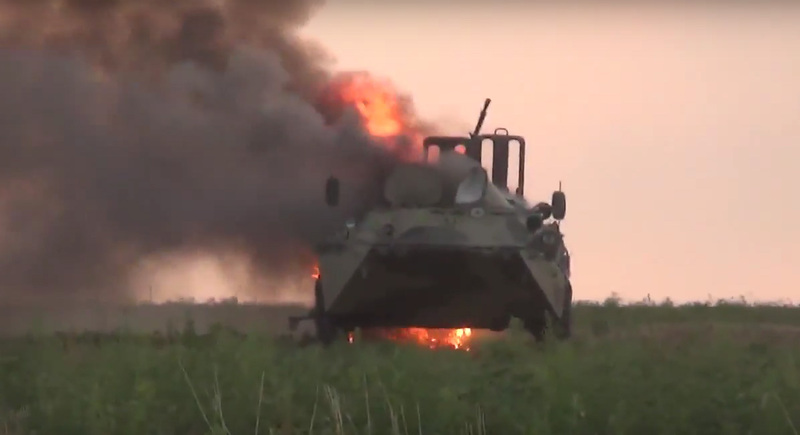 And finally the 3rd APC is also burning, this is the same APC the Russian guy with the camera and his team were following at the beginning of the video. You can see same sign in Cyrillic at the back of APC. The 3rd APC is burning also. Another part of the video of the same battle taken by the same guy was uploaded yesterday. 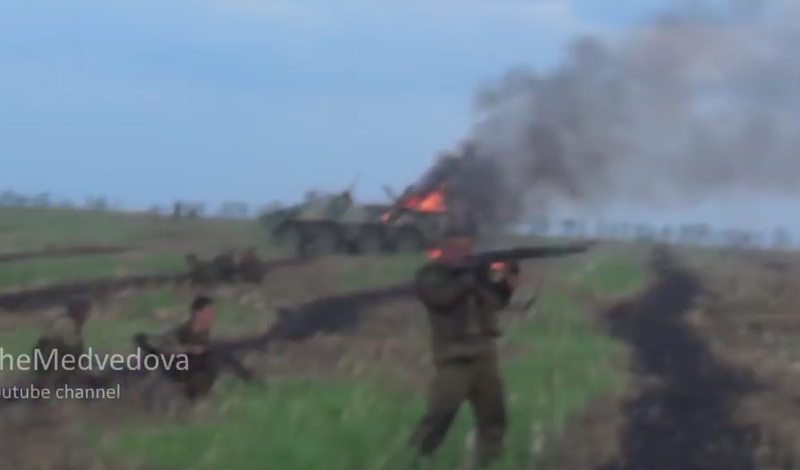 In that video you can see same APC burning in the field and same terrorists retreating. Interesting thing is what the Russian guy tells to another: Why the hell we listened to those ‘Chekhs’ and went in attack through the field? The original plan was to go through the bushes. ‘Chekhs‘ is the word that Russian soldiers used as a nickname for Chechen rebels who were fighting against them during 2 recent Chechen Wars. So Russian soldiers who were fighting in Chechen Wars before against rebels there are now fighting together with them against Ukrainian Army. 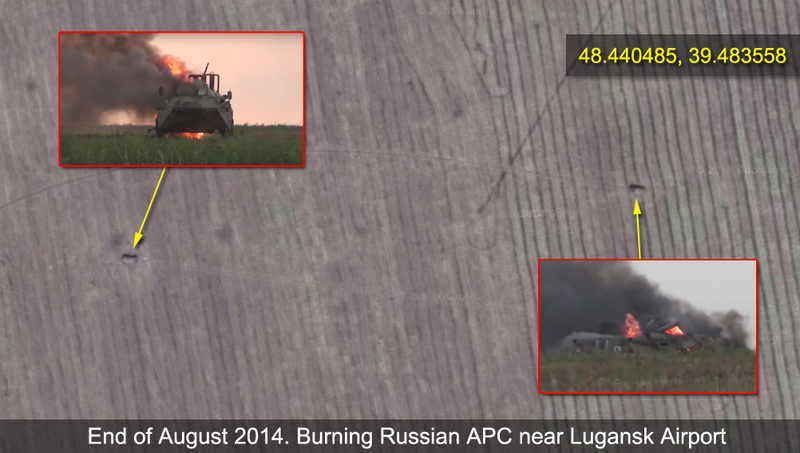 Here is a screenshot from the video that shows one those burning APC closer as the Russian fighter zoom in. UPDATE. August 14, 2015. The exact coordinates of the battle were identified. Russian APC got burnt here 48.440485, 39.483558, see of Google Map.